The historical village of New Plymouth located on the southern tip of Green Turtle Cay, is home to just over four hundred persons most of whom can trace their ancestral roots back to the Loyalists of the American Revolutionary War. The first Loyalists to come to Abaco were refugees from New York. Forced to leave their homeland after the War, they arrived at Carlton (Treasure Cay, Abaco) in August of 1783. Later, hundreds more from east Florida, Georgia, North and South Carolina joined them bringing names like Adam, Malone and Weatherford to the Roberts, Sawyers, Saunders, Russells, Currys, Bethels and Lowes. The poor soil quality refused to support these gentlemen farmers and by the close of the eighteenth century, disillusioned planters began to leave Abaco. Some die-hard Loyalists remained to take up subsistence farming while others became skillful seamen and boat builders passing these crafts on through the generations. By the mid 1850's Green Turtle Cay was the wrecking capital of the Abacos and by the 1880's pineapples and citrus were exported from New Plymouth to the United States. After the pineapple and citrus industry had run its course, sponging became the mainstay of the local economy. Many people made their living sponging during the 1930's till a blight destroyed ninety percent of the sponge beds in 1938. During World War One, sisal became the cheif export to the United States. This was the second time that sisal became the prominent industry; the first being 1888-1907 when because of the Spanish-American War the U.S. was unable to import sisal from the Philippines. There was enough trade between Green Turtle Cay and the United States to warrant a U.S. Consulate being posted in New Plymouth which now boasted a population of sixteen hundred persons. The decade of the 30's was a turning point for Green Turtle Cay. It saw the end of sponging; the begining of the 2nd World War; and it had survived the catastrophic hurricane of 1932. This hurricane destroyed or damaged about fifty percent of the buildings in New Plymouth. 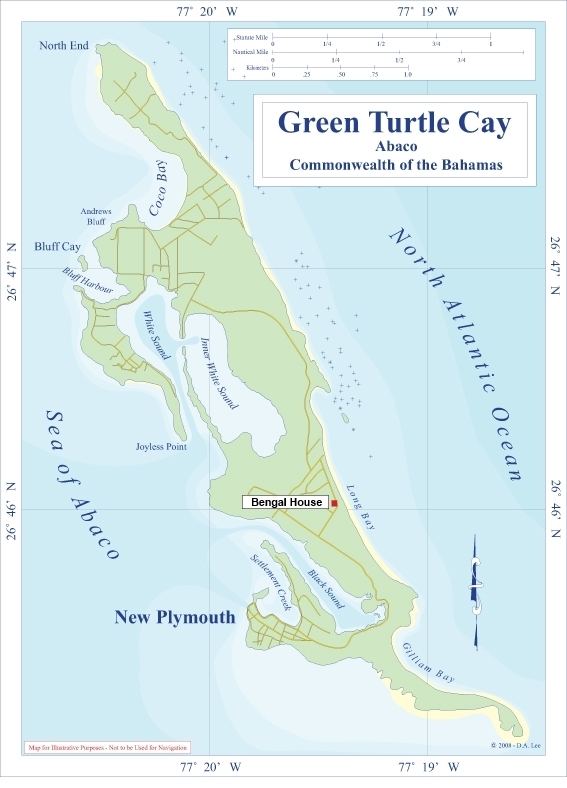 The 1930's saw a shift in population of Green Turtle Cay. Many moved to the U.S. and to Nassau. In Nassau the Abaconians were sought after by the businessmen for they were known to be hard-working and loyal employees. In the 1940's sharking became the main industry of Green Turtle Cay. Their skins and oils were exported to the United States; the skins to replace leather products and the oil for vitamins. Slowly, as the sharking industry faded out, crawfishing which had started several years before, became the main source of income for the people. Copyright © 2019 Bengal House, Green Turtle Cay All Rights Reserved.